The weather in July was favourable for the growth and development of hops as far as the precipitation and temperature are concerned. Beginning of the month was warm and dry, but view to relatively high precipitation amount of the last day of June the moisture deficit was not perceptible in hop gardens. The total precipitation amount in July exceeded 80 mm and so this month can be considered as slightly more humid in comparison with long-term average. By this way the moisture deficit of May and especially June was leveled. Unfortunately moisture came too late and consequence of the drought became already evident on hop plants. It concerned above all the reduction of the lenght of lateral shoots and lower blossoming compared with last year. Majority of hop gardens in Saaz region is now in the phase of cones creation. This phase is characteristic by different grades of cone development, when the cones are light, soft and stigma is still present. The exceptions are made by hybrid varieties which are serotinous and come to the full blossoming only on the beginning of cone forming. The health state of hops is still very good. In July the treatment against hop aphid and red spider mite was carried out on majority of hop areas. Thanks to it the occurrence of these pests in hopgardens is sporadic. The conditions for growth and spreading of downy mildew of hops were very good. 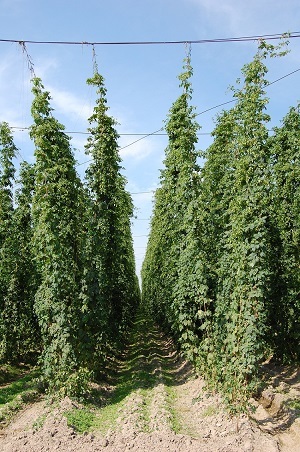 It resulted in strong infection pressure and therefore at least two protective interventions by fungicides have been carried out at all the hop gardens during July.